I have family coming in town on Friday, so besides cleaning... I always try to find a new recipe to cook for them. It has been so cold here... and when I think of cold, I think of comfort food. (Did I mention they are from Florida? Trust me, they are going to freeze and need comforting.) Does there get any more comforting than Pot Roast and for dessert - Apple Dumplings with Cinnamon Ice Cream? Oh, and did I mention that cinnamon ice cream is my aunt's favorite ice cream. I will certainly get brownie points for this meal!! We will be working on the baby's nursery and getting Kate's "big girl" bedroom ready. These are a couple of delicious and EASY recipes.. here they are.. enjoy! 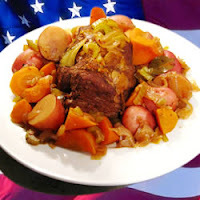 -Take the chuck roast and season with salt and pepper to taste. Brown on all sides in a large skillet over high heat. -Place in the slow cooker and add the soup mix, cream of mushroom soup, water, carrots, onion, potatoes and celery. -Cover and cook on low setting for 8 to 10 hours. She (the Pioneer Woman) is awesome at taking step by step photos with each recipe-which I am too lazy to post. If you want to see the step by step process.. click here.. but trust me - these are so easy, I think you can handle making them without the pictures. -Peel and core apples. Cut each apple into 8 slices each. Roll each apple slice in a crescent roll. -Place in a 9 x 13 buttered pan. Melt butter, then add sugar and barely stir. Add vanilla, stir, and pour entire mixture over apples. Pour Mountain Dew around the edges of the pan. Sprinkle with cinnamon and bake at 350 degrees for 40 minutes. -Serve with cinnamon ice cream, and spoon some of the sweet sauces from the pan over the top. WARNING: Prepare this dish at your own risk. It is beyond imaginable. *Please note I have Cuisinart Ice Cream Maker, which is what this recipe is for, and I highly recommend investing in one because seriously... who has time to mess with Ice and Rock Salt? Oh.. and you can make homemade ice cream in 30 min.. with little mess or fuss and all the deliciousness! -In a medium bowl, use a hand mixer or a whisk to combine the milk and 3/4 cups granulated sugar until the sugar is dissolved, about 1-2 minutes on low speed. Stir in the heavy cream, vanilla extract, cinnamon and 2 tablespoons sugar. - Turn machine on, pour mixture into freezer bowl through ingredient spout and let mix until thickened, about 25 - 30 minutes. PS - If you insist on using your old ice cream maker.. you can tweak your favorite vanilla recipe by adding two tablespoons of cinnamon and two tablespoons of granulated sugar to your mix.